The City of Vancouver has approved the proposal for redevelopment of 969 Burrard Street and 1019 - 1045 Nelson Street, sites owned by First Baptist Church - enabling the city's oldest Baptist congregation to remain at the heart of Vancouver. The redevelopment of the 107-year old First Baptist Church is one of the most anticipated projects in the city. 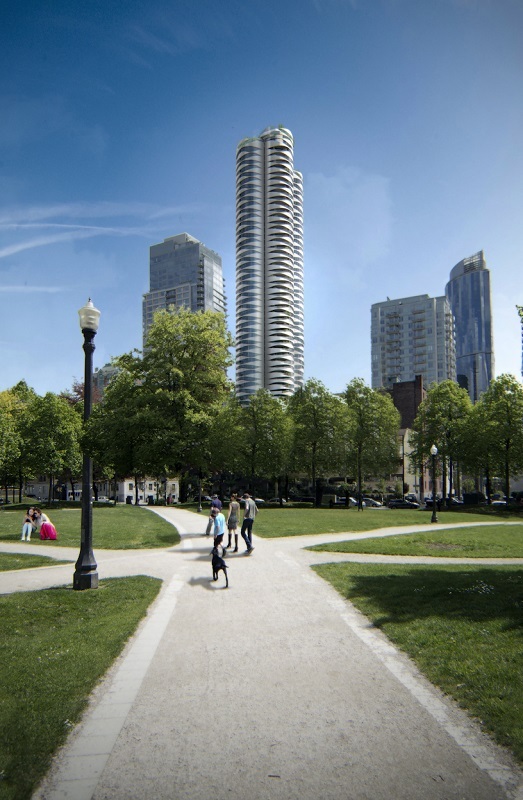 Comprised of the church and its four lots on Nelson Street, the large scale redevelopment of the site at Burrard and Nelson, will now move forward. As the landowner, First Baptist chose Westbank as its development partner in 2013, and together they engaged renowned local architecture firm Bing Thom Architects to design the redevelopment. The progressive venture will bring greatly expanded services to the congregation and broader community - including below-market rental housing, new childcare facilities, and expansion of existing programs for seniors, youth, new immigrants, and the homeless shelter that the church has run for almost two decades. The Community Amenity Contributions (CAC) for the project, valued at $91.3-million - one of the city's largest - will go towards a full seismic upgrade and restoration of the church, and a new social housing building. The majority allocation of this CAC - $65.3 million - to the City of Vancouver for strategic priorities in the West End that include community and civic facilities, parks and open space, childcare, transportation and affordable housing. The project redevelopment includes significant seismic and code upgrades to the 107-year old, A-listed heritage building, restoration of the adjacent two-storey Pinder Hall and an additional 45,000 square feet of new institutional space. This space includes a new galleria, gymnasium, multi-purpose rooms, counseling centre and a 37-child daycare space with outdoor area, effectively doubling the church's current infrastructure and enabling First Baptist Church to enlarge the capacity of its social endeavours. Housed within a new seven-storey social housing building, owned and operated by the church, will be 61 rental units - 20 market and 41 below-market rental - replacing the current 32 on-site market rental units contained in older houses and an apartment building. 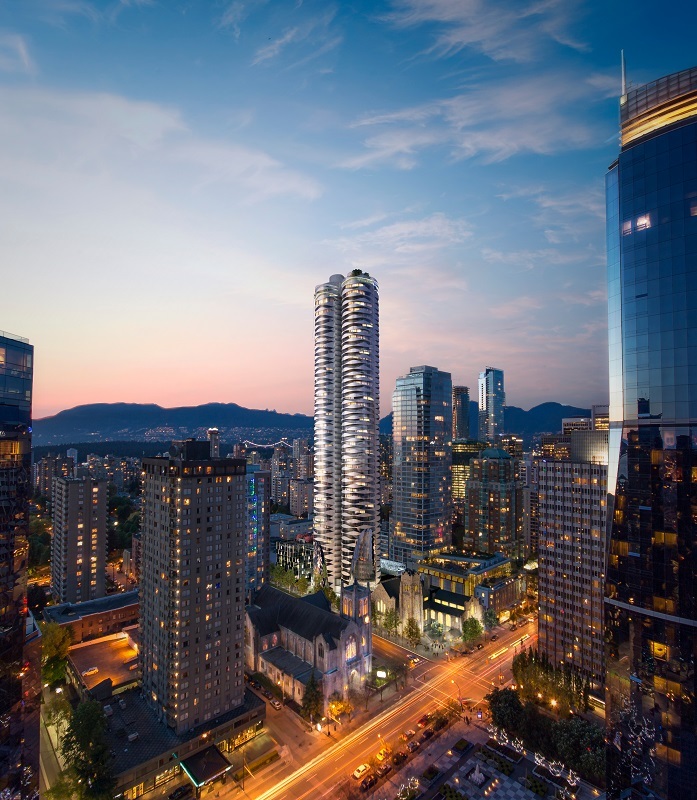 Designed to reflect the special relationship the church has with the city, an iconic 57-storey residential tower will take shape adjacent to the heritage church. Its unique cylindrical shapes, reminiscent of organ pipes, have been carefully chamfered at their bases in order to respect the historic church. To encourage community-building among residents of the new 331-unit tower, generous outdoor planted areas will be provided on each floor, including 16 new three-storey trees planted up the tower. Between the tower and the affordable housing building will be a landscaped courtyard as shared common space for all. The project supports the West End Community Plan which identifies the Burrard Street corridor for higher density and height. It further corresponds to many City policies, including a focus on sustainability and superior urban design for taller buildings. Construction, which will occur in two phases, is scheduled to begin in May 2018, with full completion anticipated for late 2022. During construction, a temporary space will be found for regular worship and ensure that the services of First Baptist Church continue through the redevelopment. The development is the first project between Westbank and Bing Thom Architects (BTA), the firm founded by the late Bing Thom. It is the first major downtown Vancouver condominium project for BTA, well-known in Vancouver for the Chan Centre at the University of British Columbia, the Central City Tower and City Centre Library in Surrey, Sunset Community Centre in South Vancouver, and the Aberdeen Centre in Richmond. The First Baptist Church of Vancouver (FBC), founded in 1887, is a vibrant multi-generational faith community, as diverse as the city in which it operates. Today, FBC serves the community from a beautiful historic building in the heart of downtown Vancouver. The congregation ranges from young to old, rich to poor, Bible scholars to seekers, singles to families, and includes many cultures. "We long to be "a community following Jesus, with a heart for the city and beyond", by loving God, one another and our neighbours in the manner expressed by Jesus in His parable of the Good Samaritan, where true neighbourliness crosses the deepest divisions." The core of Westbank's mission is to create a body of work with a high degree of artistry that helps foster more equitable and beautiful cities. Westbank is active across Canada and in the United States, with projects including luxury residential, Five Star hotels, retail, office, rental, district energy systems, affordable housing initiatives and public art. Established in 1992, they are one of North America's leading developers, with offices in Vancouver, Calgary, Toronto, Seattle, Shanghai, Beijing, Taiwan, Tokyo, Hong Kong, Shenzhen, Chengdu and Singapore, and over 25 billion dollars of projects completed or under development. Bing Thom Architects is an innovative and global architectural and urban design practice with an emphasis on community-minded work. Bing Thom Architects is a team of a visionaries and out-of-the-box thinkers. About this company Westbank Corp.